A man carries an AR-15 assault rifle across his back as he walks on a street in Abington Township. He was not breaking the law, police said. 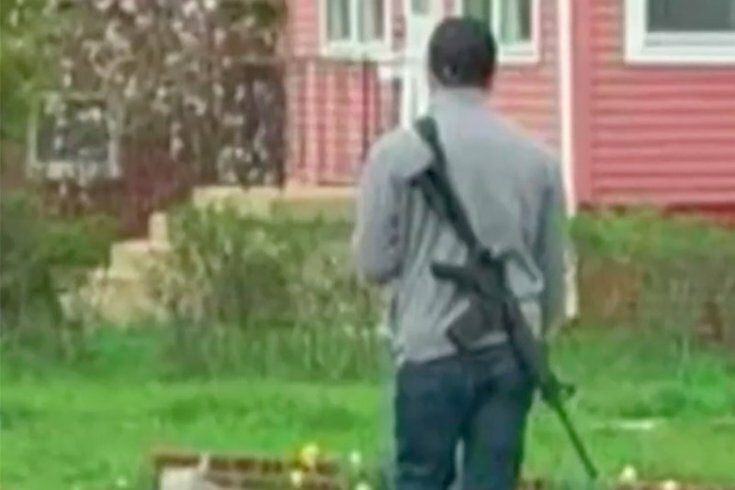 When I first heard about the dude wandering around Abington with an AR-15 for the world to see, I figure I too would have called the cops just like the many people who saw him. It’s not something you witness every day. Guns are dangerous. People are crazy. Et cetera. When I read that the man – who’s yet to be named publicly – was doing so to “gauge the political climate of Abington Township” while educating the public about his “right to carry this weapon,” I wanted nothing more than to track him down for a little chat. Sure, his “passive-aggressive” actions prompted the chief of police, Patrick Molloy, to send a letter to township residents in an effort to reassure them. Yes, it seemed like he wanted to show the world what he can, and cannot, do with a weapon that’s been villainized for its use in countless mass shootings. No, we don’t think he’s a threat. Yes, we understand the uneasy feeling he’s spread across the jurisdiction. That explains why I drove the streets of Abington, Glenside, North Hills and beyond in pursuit of an armed man on Wednesday. If he wants to make a public statement, after all, it might be proving difficult with all the knee-jerk reactions that followed. People who hate guns see him as the enemy. There’s really not much in between. Sure, I might disagree with his brashness. The underlying inspiration – wanting to spark a conversation – is worthy of exploration, though. The Second Amendment debate is divisive. If people continue to revert to their preferred talking points, it will remain that way. This guy took a different approach. I respect that. Alas, my on-the-spot interview with the man on Wednesday wasn’t meant to be. I stopped by Clayton’s indoor shooting range in Horsham hoping to chat with gun folks about their take on his approach. “That’s a negative,” said an employee who asked the owner whether he wanted to talk. I stopped by Poppert’s Gunsmithing in Glenside to talk about it, too. The gentleman there said hadn’t heard word one about the man with the AR-15, but, he added, Pennsylvania is an open-carry state. What shouldn’t come of this story is it being forgotten, one of those things-that-happened-last-week-that-everybody-forgets-by-next-week. No, I’m not suggesting gun owners follow this man's actions, even if it’s their right to do so. That’s pretty obvious as it is. Each side knows where the other side stands. What I am suggesting is each side respect the other by listening, instead of dismissing the other as Constitution-hating libtards or murderous maniacs. So, folks, if you know this guy, tell him I'm prepared to take a stroll and have an honest chat. Maybe he'll even see this himself, and shoot me an email. I'd love to come back to Abington.